Editor's Note: Reprinted with permission from the Spring 2009 issue of CorrDocs, the quarterly newsletter of the Society of Correctional Physicians (SCP). All rights reserved. In the United States, 3.9 million people are infected with the hepatitis C virus (HCV) which is a member of the single-stranded RNA family, “flaviviridae.” The majority of cases of HCV are acquired parenterally, with intravenous drug use accounting for two-thirds of all cases. Of those patients infected with HCV, 70% of patients will progress to chronic hepatitis. End stage liver disease or cirrhosis will develop in 20-30% of patients with chronic disease. Of those cirrhotic patients, hepatocellular carcinoma will develop in 4-11% of patients. Cryoglobulinemia occurs in 1% of patients with chronic hepatitis C virus and presents with a palpable purpura of the lower extremities with or without livedo and/or urticaria. Additionally, patients can present with arthropathies, glomerulonephritis and peripheral neuropathy. PCT: Skin fragility, erosions and flaccid bullae on sun exposed skin. Cryoglobulins are immunoglobulins that reversibly precipitate in the cold. Of the three subtypes of cryoglobulinemia, HCV patients account for >80% of cases of Type II cryoglobulins. This “mixed” cryoglobulin precipitant is composed of monoclonal IgM rheumatoid factor complexed with polyclonal IgG. Additional laboratory abnormalities often seen in cryoglobulinemia include a transaminitis, presence of rheumatoid factor (70-90% of cases) and decreased C3 complement levels. Treatment of the underlying HCV with interferon-alpha can improve the clinical picture of cryoglobulinemia. Patients with hepatitis C account for 10% of all cases of acquired or sporadic porphyria cutanea tarda (PCT). In one study, as many as 82% of sporadic cases of PCT occurred in patients with HCV. Cryoglobulinemic vasculitis. Lower extremity palpable purpura caused by an immune complex small vessel vasculitis in a patient with known hepatitis C virus. PCT occurs as a result of a defect in the heme synthesis pathway where uroporphyrinogen decarboxylase (UROD) becomes deficient or absent. Other environmental triggers can worsen or cause PCT including alcohol ingestion, estrogens and polyhalogenated hydrocarbons. 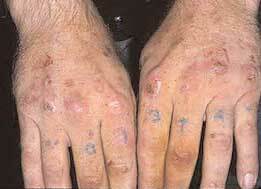 Accompanying skin findings include flaccid vesicles and bullae on sun-exposed skin, such as the dorsal aspects of the hands; atrophic scarring with milia, skin fragility, sclerodermoid changes and hypertrichosis. 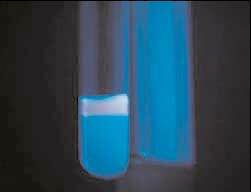 Abnormal laboratory testing includes urine that fluoresces with a Wood’s lamp. The presumed pathogenesis of HCV-triggered PCT involves decompartmentalization of iron stores resulting in liberation of free iron radicals and oxidation of UROD. PCT positive test for urine fluorescence with Wood’s lamp. Treatment can include regular phlebotomy to decrease iron stores, antimalarials and interferon-alpha to address the underlying cause. Avoidance of known triggers, such as alcohol or NSAIDs, can help to prevent flares of the disease. The reported incidence of hepatitis C virus associated lichen planus ranges from 0.1% in urban areas to 35% in endemic areas such as Italy or Egypt. Of the subtypes of lichen planus, the erosive mucosal variant has the greatest association with Hepatitis C. Clinically this can present with painful, erosive gingivitis or mucosal ulcerations with Wickham’s striae. The pathogenesis is thought to be the result of HCV growth and replication within lymphocytes. Unfortunately, mucosal ulcerative LP does not spontaneously regress as one sees in cutaneous lichen planus involving skin only. Lichen Planus. Painful erosions on buccal mucosa; notice reticular interlocking white lacy pattern classic for lichen planus. Interferon-alpha has reportedly had mixed therapeutic value and case reports of both beneficial and adverse affects on mucosal lesions are reported in the literature. Pruritis, or itching, occurs in over 15% of patients with chronic HCV infection. The severity of itching does not always parallel laboratory abnormalities such as hyperbilirubinemia or a transaminitis. Clinically, patients present with generalized pruritis often in the absence of primary lesions. Excoriations, lichenification and prurigo nodularis are not uncommonly seen. Various treatments are reported to be of benefit in patients with HCV and pruritis including usual antipruritis treatments such as topical steroids, antihistamines and doxepin. Additionally, treatment with ursodexoycholic acid, cholestyramine, rifampin, interferon-alpha and light therapy have been reported to be beneficial. Additional, but rare cutaneous findings have been reported in the setting of HCV including polyarteristis nodosa, erythema multiforme, xerostomia, pyoderma gangrenosum, psoriasis, granuloma annulare, vitiligo, erythema nodosum, Behcet’s disease and disseminated superficial actinic porokeratosis. Finally, treatment regimens that include interferon-alpha and ribavirin can themselves result in a pruritic eruption in 8% of cases. Severe itch has been reported in 1% of treated cases of HCV with interferon and ribavirin usually developing within 2-4 months after treatment with INF-alpha and/or ribavirin is initiated. Itching develops on the distal extremities, dorsal hands, face, and neck in a photo-accentuated manner. The eruption clears within 2-3 weeks after the medications have been discontinued. Dr. Scatena is an Assistant Professor in the Departments of Dermatology and Internal Medicine at the University of Colorado Health Science Center in Denver. She is also in private practice at Rocky Mountain Dermatology in Boulder. Readers may contact her at lisa.scatena@gmail.com or visit her Web site at www.RockyMtnDermatology.com.